LG is set to unveil its second generation model of its innovative CineBeam 4K short-throw projector at CES 2019. 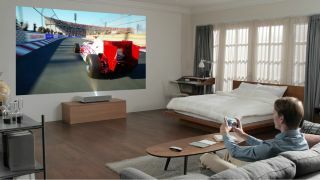 Already announced as the winner of the CES 2019 Innovation award, the compact projector will be able to project stunning 4K images to any flat surface, be it a wall, ceiling, or floor. New to this generation of the CineBeam is voice activation technology – using LG’s artificial intelligence technology ThinQ, you’ll be able to use simple voice commands to control the projector. For example, you can ask it to turn itself off after the film you’re watching has finished, or narrow your content down by saying things like “play yoga videos on YouTube”. Due to its use of ultra short throw technology – which is capable of creating large-scale projection images at incredibly short distances – you need to place the projector 2-inches away from the wall to achieve a 90-inch (diagonal) image. Alternatively, f you place the projector 7-inches away, LG says that you can produce a "much larger and still bright 120-inch image". As it delivers 2500 ANSI lumens and ultra HD 4K resolution, the new CineBeam projector should make for extremely immersive viewing for anyone who wants to bring the cinematic experience into the home. Not only that, but the projector’s wide color gamut should ensure a high degree of realism and vibrancy. And with webOS built in, the new CineBeam can stream Netflix, YouTube, and more, as well as offering lots of connection options with USB, ethernet, and HDMI ports. The new CineBeam, like its predecessor, is designed to be compact, and easily moved from room to room in your home, which along with all its other features, makes for a pretty attractive package. That being said, we're expecting it to be pretty expensive if the first generation model is anything to go by, which costs a prohibitive $2999 (around £2100 / AU$4230 based on current conversion rates). So, you’d better start saving now if you want to get your hands on the new CineBeam when it becomes available to purchase – which likely won’t be until summer 2019 if LG’s planning to follow the same schedule as last year.